The PT6103 is a highly integrated Li-ion battery linear charging management device targeted at space limited portable applications. The PT6103 offers an integrated MOSFET and current sensor, reverse blocking protection, high accuracy current and voltage regulation, charge status indication, and charge termination in SOT23,DFN6,DFN8 or ESOP8 package. The PT6103 charges a battery in three phases: trickle charging, constant current and constant voltage. No blocking diode is required due to the internal MOSFET architecture. The thermal feedback regulates the charging current to limit the chip temperature during high power operation or high ambient temperature to maximize the charge rate without risk of overheating . 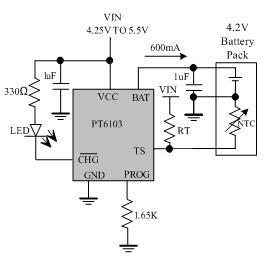 The charge voltage is fixed at 4.2V, and the charge current can be programmed externally with a single resistor. The PT6103 automatically terminates the charge cycle when the charge current drops to 1/10 the programmed value after the final float voltage is reached. Once the temperature outside the normal range thresholds is detected the PT6103 immediately stops the charging and CHG pin output 10Hz square wave. And charging is stopped until restart the chip again. And when the TS pin is floating or connected to ground, the battery temperature protection is disabled.